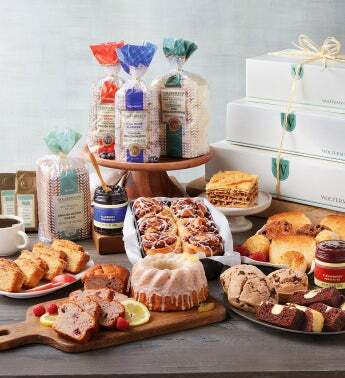 Whether you're hosting brunch at your house or headed to the office for an early morning meeting, this tower brimming with goodies offers everything you need to start the day deliciously. Three extra-large boxes arrive filled with favorites such as a variety of our extra-thick, traditional, and mini English muffins and English muffin bread, along with scrumptious cinnamon rolls and irresistible cakes and pastries. We've included preserves to spread on the baked delights along with Tiffin coffee to sip. Everything is easy to serve and enjoy.